With simple, twistable locks and quick-change bending dies, you’ll be cycling through bending projects faster than any of your competitors. Let them try to play catch-up with their cheap imitation pipe benders while you run ahead with the best. You’ll be glad you went with the world leader in pipe bending. The number one request our pipe bender customers have is simply to get the deepest bend possible. We figure a U-shape is pretty darn good. If you need to bend more than 170°, ask about our 180° dies. Our pipe benders perfectly bend on a 127 mm radius, never permitting pipe sticking or hang-ups. Our unique relief cut design keeps a uniform bend throughout the entire bend cycle and prevents excessive crimping or deformation from costing you money and wasting your precious time. A 76 mm bending die is integrated into every pipe bender we make. The design may look ordinary, but what you don’t see is the unique step-cut process we use to craft our die rails. Superior design means better-contained, larger tubing and more uniform bends across the board. Even though we call them pipe benders, they’re capable of expanding and flaring, as well. BendPak’s die options make choosing the right die for the job easier than ever. BendPak pipe benders, fitted with an extended-length, 355.6 mm top cylinder, do not require the use of pusher block extensions for small-radius die jobs. Additionally, the cylinder can be retracted, offering more clearance for die-changing, as well as the removal of bent tubes. A clampless swager comes standard on our pipe benders. Capable of putting out more than 13,608 kg of force, your end forming will be fast and extremely precise. Setup becomes a breeze as you prepare to handle I.D. expansions, O.D. expansions, slip-fits, flares, ball-joints, reductions and manifold flanges. Quick-release tooling means no old-fashioned vise will be found in the clamp assembly. Each pipe bender is engineered with narrow-hinged collars that drop into position to let the flare tubing ends as close as 76 mm during bend. The more pressure gets applied to the clamps, the better their overall grip, so slippage never becomes a problem. Our pipe benders feature a unique internal segment expander that works on I.D. expansions, O.D. expansions, slip-fits, flares, ball-joints and manifold flanges. The buttress canister has a single position setting for all I.D. expansions and can be adjusted for other sizes. A single arbor is used for all tubing sizes 38 mm - 76 mm Together, the clampless swager and internal expander make end-finishing operations much simpler (e.g., reducing, internal swaging, flares). 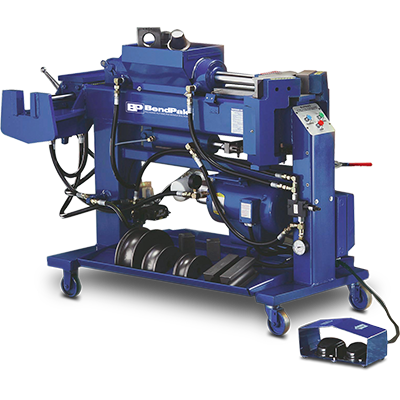 Our pipe benders are equipped with a double-ended cylinder for both the clampless swager and segment expander. A single control handle operates the cylinder and is placed toward the middle, so you can stand comfortably in one location and operate both sides. An independent remote foot switch allows you to perform manual bending operations while standing in front of the bending head or up to 4' away. Having the convenience of remote operation is an added plus, especially when handling larger tubing. Switches are industrial-grade quality and covered for your protection. Copyright © 2018 BendPak Inc. All rights reserved. Genesis Equipment Pty Ltd is a Australian importer and distributor of BendPak’s portfolio of products. Genesis Equipment Pty Ltd continues to pursue and elevate the standards of excellence through their strategic partnerships with automotive care professionals throughout Australia. As a direct Australian importer, Genesis Equipment Pty Ltd is uniquely positioned to provide customers with the lowest delivered pricing and unparalleled after sales support. Genesis Equipment Pty Ltd is an independent third-party contractors and are not agents for, not joint ventures of, and are not employed by BendPak.